Stairlifts of Louisiana is a Proud Veteran-Owned Business. Mo bility can be a challenge for the elderly and disabled, but it’s still a big part of keeping your independence. 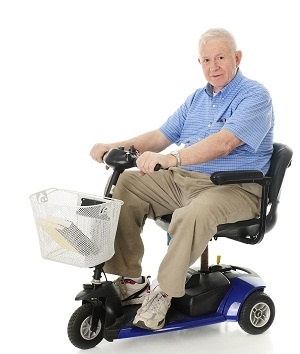 You probably want to get around on your own for as long as possible, especially in your own home. If you have stairs in your home or you want to ride your scooter into a car, that can present extra challenges, especially if you’re transitioning into a wheelchair or scooter. Fortunately, there are chair lifts and scooter lifts that can get you up and down the stairs or in and out of cars with ease, and if you’re looking at scooter lifts in Louisiana, here are a few things you may want to know. If you buy a scooter lift, you are essentially getting a platform that you drive your vehicle onto, and that platform is attached to whatever mechanism conveys it up and down. There are a few variations on scooter lifts, depending on their location and setup. For instance, cars only need lifts that go up and down, while stairs run at an angle. Even if you’re talking about stair lifts, they’re not interchangeable. You can get straight stair lifts in Louisiana, or you might need a lift that wraps around on curved staircases. The angle and length can vary greatly, too. Stair and vehicle lifts in Louisiana are useful for a few reasons. Sometimes, they might be your only option. If you can’t get up and down stairs or in and out of cars on your own, you either have to use scooter lifts in Louisiana or you have to make other life changes like moving to a new house or getting someone to help you. Even if you’re capable of walking a few steps, though, using a scooter lift is often more convenient, since you don’t have to worry about getting in and out of the scooter, which can take some extra time. A scooter lift is also safer than walking on stairs, and it can help you prevent a painful fall.